Angus MacColl hails from Benderloch near Oban in Argyllshire and began piping as a young boy, initially taught by his late father. 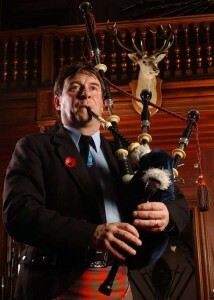 He comes from an illustrious piping family and is the Great Grand Nephew of the legendary piper and composer John MacColl. With years of piping still ahead, Angus’s contribution to the MacColl dynasty is certain to rival that of his forebears. Angus is ranked among the world’s greatest pipers who has distinguished himself by winning the Gold Medal at Inverness (1992), the Clasp (1993) and the Gold Medal at Oban (1996). He was also winner of the Glenfiddich Invitational (1995), winner of the GS MacLennan, San Diego 1997 and, in addition to being placed first in the senior ceòl beag at both meetings, he finished 2nd overall at the 1997 Glenfiddich Invitational. He won the Clasp at Inverness in 1998 and won of the Donald MacLeod Competition in 1999. Click here to listen to piper Angus MacColl filmed for the award winning film 'When the Pipers Play'. Three clips of rushes and Out Takes start with Angus at the Senior Pibroch, Argyllshire Gathering, Oban, 1996, followed by the field competition. Make sure you see the third sequence with Angus in full Ceilidh mode and some outstanding jig playing. In 2010 Angus took his third Glenfiddich title (the first being in 1995), with a poised performance of the grand old Piobaireachd 'The End of the Great Bridge', followed by a blistering display of march playing as he launched into 'John MacDonald of Glencoe' with serious intent. He excels as an entertainer and is constantly in demand at recitals throughout the country as well as being demand as a teacher at several piping schools in North America. He has won the Todds bar recital competition on four occasions and is the current champion. Angus is a member of the Spirit of Scotland Pipe Band.